TU/e researcher Linda van den Bedem developed a compact surgical robot, which uses 'force feedback' to allow the surgeon to feel what he is doing. Van den Bedem intends to market Sofie, the 'Surgeon’s Operating Force-feedback Interface Eindhoven'. 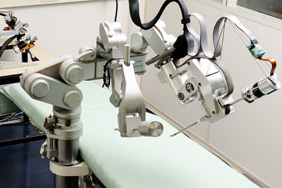 Robotic surgery makes it possible to perform highly complicated and precise operations. Surgical robots have limitations, too. For one, the surgeon does not 'feel' the force of his incision or of his pull on the suture, and robots are also big and clumsy to use. Van den Bedem (31) last week obtained her PhD degree at TU/e for a new type of surgical robot, Sofie. More specifically: she was awarded the title for the 'slave' of the robot, the robotic section performing the operation at the table. Van den Bedem built a prototype for this. The other components Sofie consists of are a master, the surgeon’s ‘control panel’, with driven joysticks. One of the distinctive properties of Sofie is the ‘force feedback', i.e. 'tactile feedback’ in the joysticks with which the surgeon operates. This counter pressure enables a surgeon to feel exactly what force he applies when making a suture or pushing aside a bit of tissue. The finishing touch of this, the control of the force feedback, is being developed. Moreover, Sofie is quite compact and hence less of an obstacle in the operating theater and above the patient. Its small dimensions come with an added bonus: Sofie’s slave is not on the floor, but is mounted on the operating table. This averts the need of resetting everything when the operating table and the patient are moved or tilted. Further, Sofie makes it possible to approach an organ from different sides and can even operate ‘around the corner’. Van den Bedem built the robot with assistance from TU/e’s technical department. The university has patented this know-how. At present Linda van den Bedem is building a business case together with colleagues in order to explore Sofie’s commercial potential. Van den Bedem informs us that surgeons are very enthusiastic about the prototype at any rate. The price must also be made considerably more attractive than that of American robots, which cost about 1.5 million dollar apiece. The researcher expects that it will definitely take some five years or so before Sofie can really be put on the market.